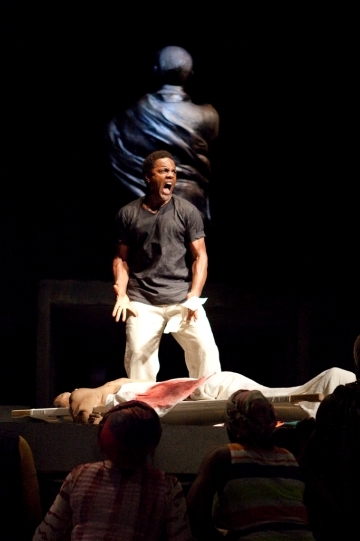 This is the African Julius Caesar, with an all-black cast, set in contemporary Africa. High concept, but high concept is necessary for the Roman plays. The comedians of the 50s and 60s leapt upon Julius Caesar and Anthony & Cleopatra every time they wanted to do cod-Shakespeare. Tunics and togas are funny. Who can forget Kenneth Williams as Caesar, “Infamy! Infamy! Everybody’s got it in for me!” Carry On Cleo, then Morecambe & Wise, Up Pompeii, A Funny Thing Happened On The Way to The Forum. Yes, classic Roman costume rings the wrong bells. Ian Mortimer in “A Time Traveller’s Guide to Elizabethan England” points out that the Elizabethans were the first British people with a sense of changes in the visual aspects of history. Medieval painters portrayed Biblical scenes in the clothes of their own era. Elizabethans were aware of what Greeks and Romans wore, and Shakespeare’s theatre probably did the Romans in togas and tunics. They had a double motivation. Plays about British history were banned in 1599, which is why Shakespeare turned to Roman history. A few togas would have helped the distancing. 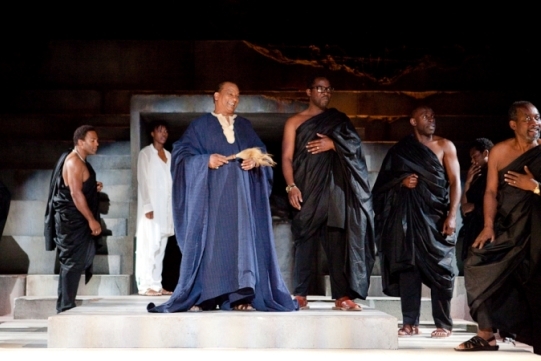 In the case of the RSC’s Julius Caesar, the costume, contemporary African + black togas for The Senate, was excellent. The whole production was masterful. The set is a concrete bunker, at the base of a giant statue of Caesar which is facing away from us. 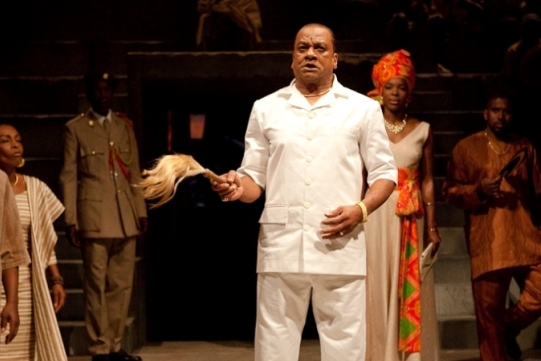 The hair and head shape matches Jeffrey Kissoon as Caesar. The concrete shows signs of serious decay and warfare. (Three days after posting this, I read that it was a football stadium with players entrance and terraces, as this is where great events often take place in Africa, be it rallies or mass killings). Yes, that fits, but neither of us had realized it. A useful programme note on design, as in the RSC’s Macbeth / Tempest would have helped). As we went in, twelve minutes before the start, the crowd of volunteer extras are already milling around, the band are playing. The actual start of the play is the Soothsayer dancing to the front of the thrust stage. In the first ten minutes with twenty plus in the crowd scenes, dancing, music, I thought it set to be an ultimate Shakespeare production. Unfortunately, we didn’t see as much of that vibrant crowd of recruited amateur extras as I would have liked. With regard to the play, Julius Caesar, this production is as good as you’ll get. However, the play itself has grave intrinsic limitations for me. It was popular in English public schools when everyone studied Latin and Greek. In the 21st century an EngLit teacher I know considered it the play that was guaranteed to turn kids off Shakespeare, so the set book to be avoided. ‘Nothing in it whatsoever for the girls,’ she said. She hadn’t seen the toned Mark Antony with his shirt off. I reckon that would have had sixth form appeal. The programme notes how the plot resonated powerfully with African teenagers, and also how Shakespeare would be able to relate to 2012 Africa more than modern Britain. It cites beliefs in portents, soothsayers, witchcraft, nature spirits, dictators who would kill at a whim. You can add mercenary armies roaming the countryside. Shakespeare’s England was unusually free of that, but it happened in the Wars of the Roses, and was to happen in the Thirty Years War in Europe. The African connection is all valid, but dramatically Act Five is still an unwanted addendum, getting the history over with. 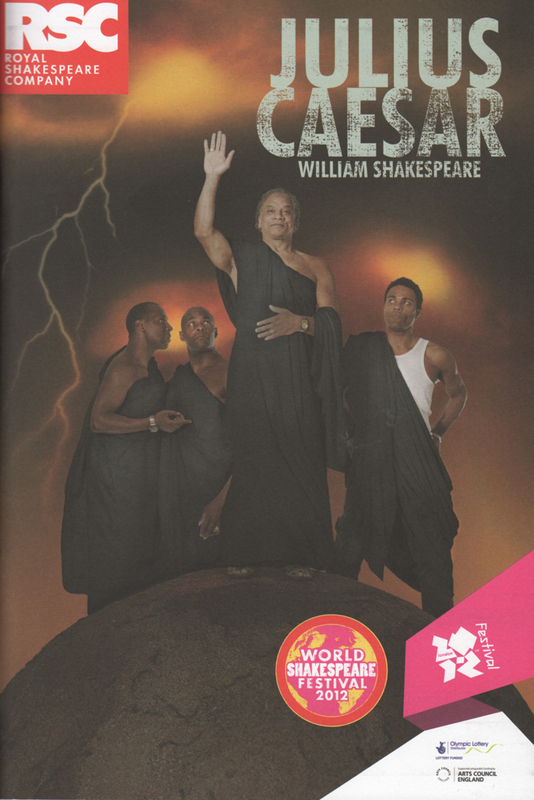 Advance publicity equates Julius Caesar with African dictators. It even mentions Idi Amin. Well, Julius Caesar was never reported to have kept body parts of enemies for a midnight snack, and Amin is a dictator too far. Mind you, Amin never staged a fight to the death between armies of two thousand captives (plus horses and elephants) in the Circus Maximus. There is a strong degree of resonance, which is amplified by given names. Julius Nyere of Tanzania, a genuine “great leader” springs to mind. Nyere translated the play into Swahili. Cassius Clay is another modern name. Those Roman names relate to the conceit in the ante-bellum South of proving your education by giving slaves classical names, so Africans called Julius and Cassius sound fine. 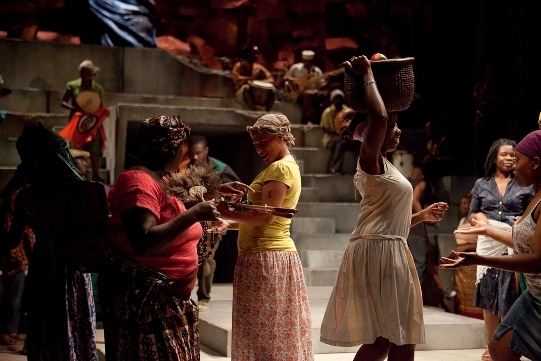 The production is in African accents, not a problem, as everyone has them, so you get aclimatised quickly. This is in contrast to plays where a lone African accent (or Ulster, Welsh, Scottish) is used for effect. The four principals … Brutus, Caesar, Mark Antony, Cassius … give an acting masterclass. Brutus is forever giving us quick glimpses of his humanity, Caesar is the definitive ageing man of power with his horsehair fly whisk. Mark Antony’s long soliloquy at Caesar’s funeral is an upfront, powerful solo Shakespeare soliloquy as you’ll ever hear. The African references are many. The crowd, the music, the mob killing of Cinna with a tyre necklace and petrol, and at the end Brutus recruiting his servant as a “child soldier” and turning around the rifle the boy is holding upside down. The soothsayer is covered in white ashes or paint, and is a big scary figure of a medicine man, not the aged hag beloved of Roman spoofs. The crowd reaction to Mark Antony’s long funeral oration is the high point of the play, combined with its transfixing delivery by Ray Fearon… preacher? democrat? demagogue? The notes in the programme point to Mark Antony’s words … like the Tea Party claiming to be Aw Shucks down to earth folks, complaining about the smooth natural oratory of Obama, just as Mark Antony pretends to defer to Brutus. 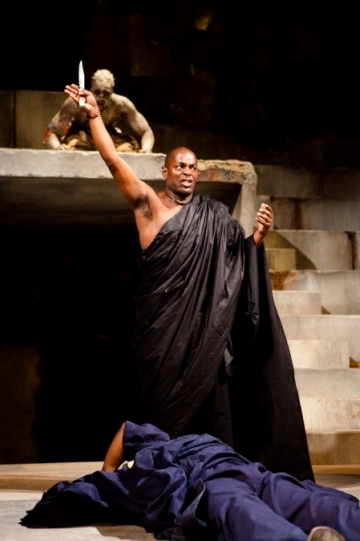 Paterson Joseph fills the lead role of Brutus. If Shakespeare had applied the same title criteria to Macbeth, he’d have titled it MacDuff (or Duncan). If he’d applied it to Hamlet, it would be The Tragedy of Polonius. This should be The Tragedy of Brutus. Caesar dies in Act III. Act IV is entrancing because Mark Antony’s shifts are so complex and calculated. But what about Act V? You know Brutus is bound to die. The waiting for it to happen, with everyone rushing around “Another part of the field” is ultimately tedious. I can’t see it done better in practice than they did it here, the uniforms, the movement, the sound effects are superb … the issue is the original plot. One thing I noticed about Julius Caesar and Richard III, is that the RSC has got over its obsession with flying. There wasn’t any, though the previous productions have all made sure they used the facility in the rebuilt theatre. Good. There’s no need to shoehorn it into every production. The negative is a major one. The production is billed as two hours ten minutes with no interval. Online, Greg Doran says two hours fifteen minutes. It ran to nearly two hours thirty minutes, with no interval. I was surrounded by uncomfortable, very restless people. We squirmed. Half a dozen had to go out for a pee. If you’re six foot tall, it’s a very long time. I was taught in teacher training that the maximum time for human bum / seat interface is ninety minutes. Director Greg Doran says that Shakespeare had no intermissions. That’s “generally believed” but no one knows. My drama teacher, who was an ex-stage manager and the most erudite Shakespeare scholar I’ve met, believed that there were breaks between Acts of a few minutes, as they had no lighting for fast transitions, and that “other entertainment” may have filled the gaps while people peed or bought wild boar burgers. He suggested jugglers and dancing bears. That was why his lectures and seminars were so entertaining. Julius Caesar is a very hard one to find a break point for without losing momentum, and you’d probably go for a shorter first half. I’m sure that the producers could also reference cinema films at this 2.5 hour length or more. There are crucial differences. I’ve never been in a cinema with seats as cramped and hard as the RSC. In the cinema, an essential pee break might upset a few of your neighbours, but it won’t disturb the actors on the screen, so you don’t feel constrained to sit it out. In cinemas, you all sit square to the screen. In the RSC many seats have an angle (not the square central seats they assign to reviewers, of course). There’s often a slight twist to back and neck. A production of this length without an interval is either blind arrogance, or even fear of losing some of the audience in the interval. OK, I know it’s really the fear of losing impetus and audience concentration, but there are four break points written into the original. In fact, what was wrong with two interval Shakespeare? You could do it on the longer plays with short intervals, ten minutes instead of twenty … Richard III, the day before, would have been greatly improved by it … but only if you have adequate loos, which the rebuilt RSC doesn’t. They should check out (e.g.) the Basingstoke Anvil to see that with adequate provision of ladies loos, you could have shorter intervals. Personally, I didn’t need a pee and never bother with ice-cream, but I’d have loved five minutes to stand up straight and stretch. Greg Doran seems an ideal choice as the new RSC director, but I have to hope the “no intermissions” idea doesn’t spread. Saw this production in Newcastle last night. We had an interval and, much as I was enjoying the action it was necessary to aid concentration. It certainly didn’t detract. Agree totally about Act V. It feels too busy, as if they’re trying to get to a conclusion. The acting was superb and I felt that Mark Anthony’s speech and crowd reaction was spot on.I found the African intonation gave a different feel to the language, making it very relevant to the action. All in all very enjoyable.